A few days ago, I followed up on a friend’s speculation on how to pay off the absolutely gynormous national debt, which is about $13.7 TRILLION dollars (or $ 1.37 x 10^ 13, if you prefer scientific notation). Currently this is owed to various mutual funds here in the US and, more and more, to overseas banks, particularly those in China. The annual interest on the national debt is one of the largest items in the national budget. If that amount was divided equally among all 310 million of us, most of us would be bankrupt, since each one of us would have to pay about $44,000 – forty-four thousand dollars. However, not all of us. For the the billionaires, the hundred-millionaires, and so on, that’s merely a weekend excursion at some fancy beach or ski resort. 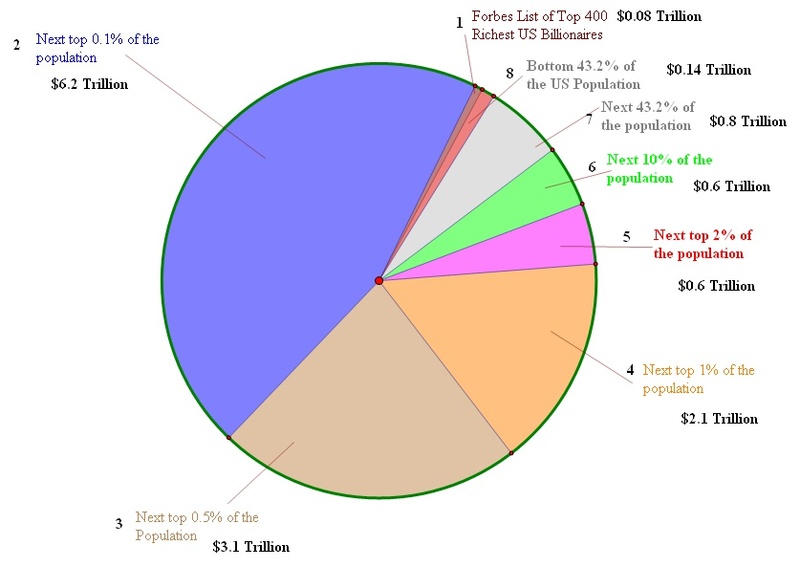 Here is a little pie chart showing one way of dividing up the national debt according to the principle that those with the most should pay the most. We US citizens have an enormous problem: our unbelievably huge, thirteen-TRILLION dollar national debt, which is causing our entire government to be in hock to the Chinese banking establishment. The next top 1/10 of 1% of the US is also unbelievably wealthy. BTW: that’s much less than the value of just ONE of their many houses. Who so far haven’t paid a penny. It’s our turn now. I don’t know about you, but I can afford that. And over 40% of the population, the poor, don’t have to pay a cent. And the entire national debt is PAID OFF!